Damaging winds lashed parts of southeastern Australia on Friday, fanning bushfires and felling trees. 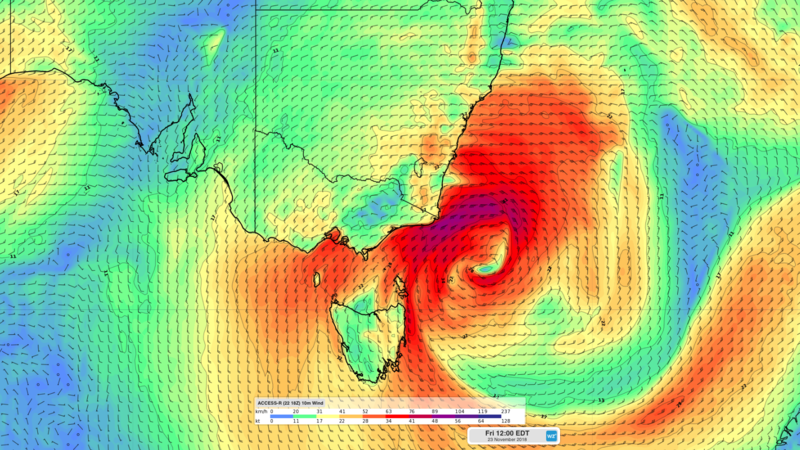 A deepening low pressure system located to the east of Bass Strait caused strong and blustery winds over a large area of southeastern Australia. Severe weather warnings for damaging wind gusts were in place for parts of central and southern NSW, central and eastern Victoria and northeast Tasmania on Friday morning. Friday's blustery winds are fanning an out of control bushfire near Salt Ash in the Hunter District of NSW. Wind gusts at nearby Newcastle Airport increased from around 50km/h to 80km/h between 7am and 8am on Friday, with further strengthening likey as the day progresses. The strong to gale force winds have also brought down a number of tree branches during the last 24 hours, blocking roads and cutting power lines. According to Ausgrid, power was cut to around 1,400 customers in the Avondale region of NSW on Friday morning when a tree branch fell onto overhead power lines. This come a day after fallen trees and branches blocked roads in Kincumber, the Blue Mountains and Killara. The intense Tasman Low will slowly move out to sea during the next 24 hours, which will allow wind to ease from Saturday.